DATO' DR ARUMUGAM GANENDRAN DPMT, MBBCh, MD, MA (Theo), FRCA, FRCP (Edin) FANZCA, the first Chair Professor of Anaesthesiology in 1975 at the University of Malaya writes from Brisbane, Australia where he currently resides. Since the first Ether – Air anaesthetic was given using a simple improvised vaporizer in March 1847 in Malacca, the momentum for the use of anaesthesia administered by appropriately trained and qualified doctors only began to build up about a century later, after World War II. As one who commenced his early training in the late 1950s. I feel it is my privilege to have been given the opportunity to review this book. Well trained anaesthesiologists of today from eminent institutions abroad and also from local universities are enabling surgeons to perform complex surgical procedures by providing collaborative preoperative optimization, safety during the procedures and intensive post operative care. They have truly become the perioperative physicians of today while also attending to intensive care, pain management and resuscitation. The capture of this rich and intriguing history has eluded many doctors in the past. In its wisdom, the Malaysian Society of Anaesthesiologists assigned the responsibility to two highly esteemed anaesthesiologists, Dr Alexander Isaac Gurubatham and Dato' Dr A. Damodaran to research, harness and document this history in a book. It is clear from the book that they have relentlessly pursued this, seeking information from unusual sources, interviewing many personnel and going through numerous photographs. In short they have left no stone unturned. 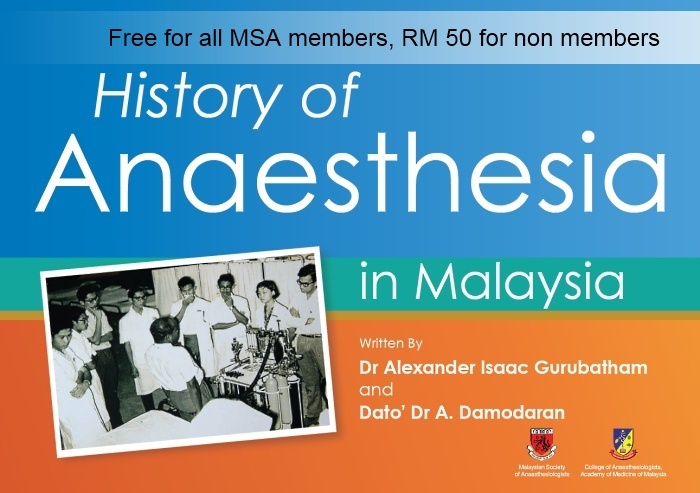 It will undoubtedly go down in history as the one and only authentic book on The History of Anaesthesia in Malaysia. I recommend that this book be read and owned by every Malaysian Anaesthesiologist and by all aspiring ones too. It would be a true source of inspiration to have knowledge of what the pioneers in anaesthesia had done.